Put the butter in a heavy pan and let it melt. 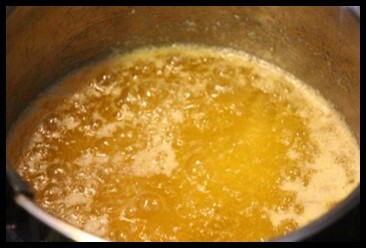 When it starts boiling, turn down the heat until the butter just boils and continue to cook. Keep a close look on the ghee, as it can easily burn. Do not cover the pot. The butter will foam and pop while it cooks. It will start smelling like popcorn and turn a golden color. Take a dry spoon to move away white foam on top. When the liquid is clear and stopped making noise, then it needs to be taken off the heat. Let it cool and then carefully pour in a dry glass container with a lid. Discard the milk solids at the bottom of the cooking pan. 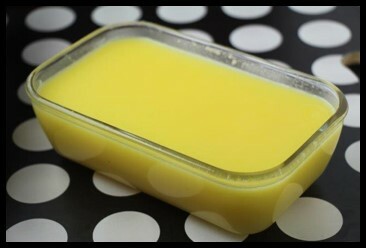 Ghee does not need refrigeration and has lengthy shelf time. The medicinal properties are believed to improve with age. Store it in a dry place away from direct sunlight. 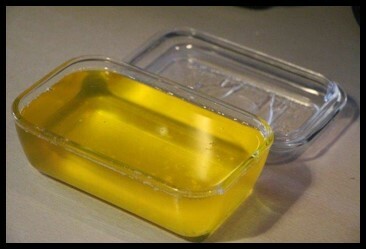 Don’t serve the ghee with a wet spoon as this will create conditions for bacteria to grow and spoil the ghee.